Atrium 6 is perfect for people who love to spend their days outdoors. These speakers can be placed near a pool, on the ceiling, patios and can be even installed in a wide open space. Looking for the perfect outdoor and weather-proof speakers? Buy Polk Audio Atrium 6 now and upbeat your home with its remarkable sound quality! Polk Audio Industry consistently take the Atrium Series to the next level, always exceeding their customers’ demands and preferences by offering not just simply the efficacy of audible range but always with a whole lot more. People have witnessed how the Series have constantly added features throughout the years. While most of us know that Atrium 6 is quite expensive, let us know the reasons why people consistently keep on buying these speakers. Atrium 6 is one of Polk’s flagships, thereby owning their good reputation and name in the audio industry. Polk Audio Atrium Speakers exceed the limits of both industrial and military specifications primarily to withstand environment exposures such as weather, seacoast atmosphere and immersion in water, providing suitable and highly durable speakers for outdoors. Polk Audio Atrium 6 Speakers comes in pairs, available in white or black surface colors, with newly designed Tweeter Phase Caps that smoothes frequency response and Anodized Aluminum Tweeter Domes with Rubber Surrounds that provides a more rigidity and durability. Anodized Aluminum Tweeter Domes with Rubber Surrounds would definitely last longer! Tweeter Domes provide a smooth, wider dispersion of sound waves. Anodized Aluminum provides smooth, lightweight corrosion-resilient surfaces you might need for an outdoor enjoyment. The military specifications and standards are exceeded by Atrium Series Speakers and several test methods are conducted to ensure environmental endurance. One of the methods includes the Standard Practice for Cyclic Salt Fog. This provides a realistic simulation of factors that causes corrosion of painted metals such as rain, temperature cycling, UV light, wet and dry cycling, and condensed dew. Atrium speakers, through this method, maintain their paints. Another test method is the Military Standard 810 Immersion. This is used to determine if the speakers can still operate during or after the immersion of speakers in water. The last test, Military Standard 883 Method for Salt and Corrosion, also simulates the effects of seacoast atmosphere on electronic devices such as speakers. Polk Audio Atrium 6 Speakers is available in black and white colors. Polk Audio Atrium 6 Speakers have definitely earned outstanding results and feedbacks from customers because of its high sound quality and unique features. Some of the clients who bought this find it much better than Bose speakers! Others have described Atrium 6 as a speaker with a remarkable sound quality that also possesses sound of an indoor theater system without any sorts of echoes, sound distortions and feedbacks. 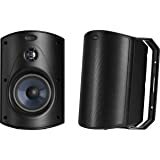 Most of the customers highly regarded these as speakers with solid construction and an easy installation, thanks to the sturdy brackets and Speed-Lock Mounting System. Polk Audio Atrium 6 is a ‘must have’ speaker. It is guaranteed that these speakers will satisfy everyone’s preferences that you might also end up buying even more! Atrium 6 is highly recommended for parties and outdoor celebrations especially for customers who have a wide outdoor space. First introduced in 2002, these speakers have consistently provided positive remarks and feedbacks from the customers. It is evident that Polk always prioritizes whatever the people want to have. Today, more people are still into buying Atrium 6 and have earned a 4.8 over 5 stars customer reviews! Upbeat your home and discover the reasons why Atrium 6 is worth your money.